Th17 cells are central to the pathogenesis of autoimmune disease, and recently specific noncoding microRNAs have been shown to regulate their development. However, it remains unclear whether microRNAs are also involved in modulating Th17 cell effector functions. Consequently, we examined the role of miR-155 in differentiated Th17 cells during their induction of experimental autoimmune encephalomyelitis. Using adoptive transfer experiments, we found that highly purified, myelin oligodendrocyte glycoprotein Ag-specific Th17 cells lacking miR-155 were defective in their capacity to cause experimental autoimmune encephalomyelitis. 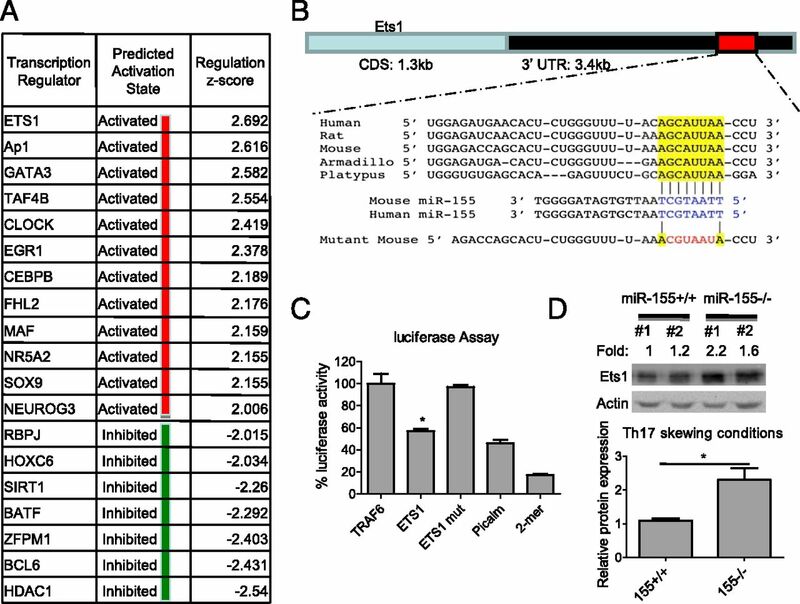 Gene expression profiling of purified miR-155−/−IL-17F+ Th17 cells identified a subset of effector genes that are dependent on miR-155 for their proper expression through a mechanism involving repression of the transcription factor Ets1. Among the genes reduced in the absence of miR-155 was IL-23R, resulting in miR-155−/− Th17 cells being hyporesponsive to IL-23. Taken together, our study demonstrates a critical role for miR-155 in Th17 cells as they unleash autoimmune inflammation and finds that this occurs through a signaling network involving miR-155, Ets1, and the clinically relevant IL-23–IL-23R pathway. Autoimmunity occurs when dysregulated, autoreactive immune cells inappropriately respond to self-Ags and cause unwarranted inflammation that is destructive to sophisticated tissue systems (1). Recently, Th17 cells, a subset of CD4+ T cells defined by their expression of IL-17 cytokines, have emerged as key drivers of tissue inflammation. Th17 cells promote both the onset and persistence of inflammatory responses during autoimmune disorders including multiple sclerosis, arthritis, psoriasis, lupus, and inflammatory bowel disease (2, 3). Because of their central roles in driving disease, significant effort has gone into understanding the genes and pathways that regulate Th17 cell development. Skewing of naive CD4+ T cells toward the Th17 lineage is driven by the cytokines IL-6 and TGF-β, which induce Th17 cell signature genes through such factors as Stat3, RORγt, Ahr, Batf, and Irf4 (4-12). Furthermore, differentiated Th17 cells must receive additional signals from cytokines such as IL-23 to expand and achieve full inflammatory potential in vivo (13–17). Recently, noncoding microRNAs (miRNAs) have also been found to regulate Th17 cell development (18, 19). However, how miRNAs fit into the known regulatory circuits underlying Th17 cell biology remains an important area of investigation. miRNAs are small, ssRNA molecules that negatively regulate target gene expression posttranscriptionally. Specific miRNAs have been shown to support proper development of immune cells in mammals and have just recently been implicated in autoimmunity (20, 21). Among the miRNAs expressed in immune cells is miR-155, which modulates the development of various inflammatory T cell subsets, including Th1, Th17, and regulatory T cells (18, 22–26). Demonstrating its importance during inflammation in vivo, we and others have recently shown that miR-155−/− mice are highly resistant to distinct mouse models of autoimmunity, including experimental autoimmune encephalomyelitis (EAE)—a model of human multiple sclerosis, T cell–dependent colitis, and collagen-induced arthritis (18, 24, 27). Furthermore, dysregulated expression of miR-155 is also observed in mice and people with various types of autoimmune disorders (24, 28–30). Although these reports reveal a prominent, clinically relevant role for miR-155 during autoimmunity, they have not determined whether this is a consequence of reduced inflammatory T cell numbers or compromised effector cell function. Furthermore, it remains unclear how miR-155 functions at the molecular level to instruct Th17 cell biology. In the current study, we have investigated the role of miR-155 in differentiated Th17 cells. This was accomplished by generating a novel mouse strain that allows for the isolation and analysis of viable, miR-155−/− IL-17F–expressing CD4+ T cells that specifically recognize the myelin oligodendrocyte glycoprotein (MOG)35–55 Ag. Our studies find that purified miR-155−/− Th17 cells are extremely defective in causing EAE following adoptive transfer when compared with wild-type (Wt) controls. Furthermore, we demonstrate that miR-155 directly targets the transcription factor Ets1 to regulate a subset of Th17 cell–effector genes, which includes the IL-23R. Consequently, miR-155−/− Th17 cells are hyporesponsive to IL-23, revealing a new link between miR-155 and the highly relevant IL-23–IL-23R pathway (31–36). All experiments were approved by the University of Utah Institutional Animal Care and Use Committee. miR-155+/+, miR-155−/−, Rag1−/−, IL-17F red fluorescent protein (RFP)+/−, 2D2 TCR Tg, and combinations of these mice are all on a C57BL/6 genetic background. miR-155−/− mice were crossed with IL-17F RFP+/+ to create miR-155+/−IL-17F RFP+/− mice, which were crossed further to create both miR-155+/+ and miR-155−/−IL-17F RFP+/− mice. miR-155+/+IL-17F RFP+/+ and miR-155−/−IL-17F RFP+/+ mice were crossed with Wt 2D2+ to create miR-155+/+IL-17F RFP+/−2D2+ and miR-155−/−IL-17F RFP+/−2D2+ mice, respectively. Genotyping was performed as described previously (22, 37, 38). EAE was induced in mice as described previously (18). Briefly, MOG35–55 peptide (BD Biosciences) was emulsified in CFA (100 μg/ml) and injected s.c. into the base of the mouse’s tail. Pertussis toxin was injected i.p. into mice on days 0 and 2. Clinical symptoms of EAE were scored according to the following criteria: 0, no symptoms; 0.5, partially limp tail; 1, completely limp tail; 1.5, impaired righting reflex; 2, hind-limb paresis; 2.5, hind-limb paralysis; 3, forelimb weakness; 4, complete paralysis; and 5, death. For Th17 cell skewing, CD4+ splenocytes were isolated by using a CD4+ T cell isolation kit (Miltenyi Biotec) per manufacturer’s instruction. The CD4+ T cells were cultured in RPMI 1640 medium supplemented with plate-bound anti-CD3e (5 μg/ml), soluble anti-CD28 (2 μg/ml), IL-6 (50 ng/ml), and TGF-β (3 ng/ml) (BioLegend) for 72 h. For some experiments, anti–IL-4 (5 μg/ml) and anti–IFN-γ Abs (5 μg/ml) were supplemented to increase the differentiation of Th17 cells, or IMDM was used instead of RPMI 1640 medium. For delivery of the control or Ets1 short hairpin RNA (shRNA)–expressing retrovirus or MIG-IL-23R (Addgene 24066) (39) retrovirus, CD4+ T cells were cultured in RPMI 1640 medium with anti-CD3e and anti-CD28 for 24 h. The next day, cells were spin infected with retrovector-containing medium (2500 rpm, 30°C) for 90 min and cultured in Th17-skewing conditions. The retrovirus was produced by transfecting 293T cells as described previously (40). Infected cells were GFP+, whereas IL-17F+ cells were RFP+ during FACS analyses. For analyses of IL-17F–expressing RFP+ Th17 cells, cells were stained with fluorophore-conjugated anti-CD4 Abs, followed by FACS analysis using a BD LSRFortessa machine and FlowJo software. To detect intracellular expression of IL-17A or IFN-γ, splenocytes, lymph nodes, or brain cells (purified with Percoll) were isolated from mice and seeded in 96-well plates. Cells were treated with 750 ng/ml ionomycin, 50 ng/ml PMA (Calbiochem), and 1 μl/well of GolgiPlug (BD Biosciences) for 4–5 h at 37°C. Cells were subsequently surface stained with fluorphore-conjugated CD4 and CD3e Abs, followed by permeabilization and fixation. After washing, cells were stained with fluorophore-conjugated IL-17A Ab (eBioscience) for 20 min at 4°C and further analyzed by FACS. In some experiments, control or Ets1 shRNA-infected GFP+RFP+ cells were FACS sorted and stained to detect the expression of IL-17A. For p-STAT3 staining, RFP+ Th17 cells were sorted after in vitro skewing and replated in 96-well plates. Cells were treated with IL-23 and subjected to p-STAT3 staining (BD Biosciences phosflow mouse anti-Stat3 [pY705]) per manufacturer’s instruction. To analyze the relative levels of mRNAs encoding BIC, IL-17F, IL-17A, IL-23R, IL-22, Ets1, IL-2 or L32, Sybrgreen-based quantitative real-time PCR (qPCR) was conducted with the LightCycler 480 PCR system (Roche) and gene-specific primers. Primer sequences are available upon request. For all experiments, mRNA was normalized to L32. For the microarray analysis, CD4+ T cells were purified from both miR-155+/+ and miR-155−/−IL-17F RFP+/− mouse spleens and cultured in vitro with Th17-skewing conditions. CD4+RFP+ and CD4+RFP− cells were sorted for both genotypes. Total RNA was isolated using the RNeasy kit (Qiagen). Global mRNA levels were assayed using the SurePrint G3 Mouse GE 8 × 60K Microarray Kit (Agilent), which was carried out by the University of Utah core facility (https://bioserver.hci.utah.edu/microarrayweb/ordering.html). The data were analyzed further using Genesifter and Ingenuity software. All data have been deposited into the National Center for Biotechnology Information Gene Expression Omnibus database under accession number GSE45122 (http://www.ncbi.nlm.nih.gov/geo/). ELISAs to detect expression of IL-17A and IFN-γ were performed with cytokine-specific kits (eBioscience), according to the manufacturer’s instructions. Cell pellets were lysed in 8 M urea buffer. Protein extracts were subjected to gel electrophoresis and transferred onto a nitrocellulose membrane, followed by Ab staining (Ets1 and β-actin; Santa Cruz Biotechnology) and detection as described previously (40). Expression levels were quantified using National Institutes of Health ImageJ software. A region of the 3′-untranslated region (3′-UTR) of mouse Ets1 containing the conserved miR-155 binding site was cloned downstream from luciferase in the pmiReport plasmid. Site-directed mutagenesis was used to disrupt the seed sequence. The forward and reverse primer sequences for cloning Ets1 are 5′-gtaactagtTACCCGAAACATGGAAGACTC-3′ and 5′-gttaagcttTGCACAGCATGGCTAGGA-3′, respectively. The restriction enzyme sites are in lowercase. Luciferase assays were carried out as described previously (40). In brief, 293T cells were transfected with combinations of a miR-155 expression plasmid, a luciferase expression construct with a 3′-UTR, and a β-galactosidase expressing plasmid for normalization. Statistical significance was determined by performing a Student two-tailed t test. A p value < 0.05 was considered significant. For the ingenuity transcription factor analysis, the z-score is calculated by the Ingenuity Pathway Analysis software and represents the confidence that a transcription factor is activated or repressed based on the consistency between the direction of change of known targets of the transcription regulator from the microarray data set and what is expected from literature. To investigate the role of miR-155 in Th17 cell function and to circumvent the limitations of using intracellular staining to identify Th17 cells, we developed a mouse strain where miR-155−/− Th17 cells are marked with the RFP under the control of the IL-17F locus (Fig. 1A). IL-17F RFP reporter mice have been described previously and shown to faithfully mark Th17 cells both in vitro and in vivo (38). To retain IL-17F function, we created both miR-155+/+ and miR-155−/− IL-17F reporter mice that are heterozygous for the IL-17F RFP reporter gene. This approach disrupts one allele of the endogenous IL-17F gene and leaves the other intact to be expressed during Th17 cell development (Fig. 1B). We observed defective expression of IL-17F mRNA in miR-155−/−IL-17F+/− RFP reporter CD4+ T cells compared with miR-155+/+ control cells under Th17 cell–skewing conditions (Fig. 1B). Creation of a miR-155−/− IL-17F RFP reporter mouse strain. (A) Generation of miR-155+/+ and miR-155−/− IL-17F RFP reporter mouse strains. Left: Schematic diagram showing the mouse cross. Right: Genotyping results demonstrating completion of the desired mouse strains. (B) Expression of IL-17F mRNA by CD4+ T cells from the indicated genotypes cultured under Th17 cell–skewing conditions was assayed by qPCR over a time course. (C–E) CD4+ T cells were isolated from miR-155+/+ and miR-155−/−CD4+ IL-17F RFP+/− mice and cultured in vitro under different Th17 cell–skewing conditions. (C) After 72 h, expression of RFP was assayed by FACS. (D) Average percentage of IL-17F+ cells in different in vitro culture conditions (n = 4). (E) ELISA of IL-17A from in vitro cultured CD4+ T cells. Error bars represent ± SEM. *p < 0.05. Next, we analyzed the capacity of CD4+ T cells from both miR-155+/+ and miR-155−/−IL-17F RFP+/− reporter transgenic mice to express the RFP reporter gene under a variety of different Th17 cell–skewing conditions. Impaired Th17 cell differentiation by miR-155−/−IL-17F+RFP+/−CD4+ T cells compared with miR-155+/+ controls was observed in all cases, as determined by monitoring the formation of RFP-expressing T cells by FACS (Fig. 1C, 1D). Defective IL-17F RFP expression in the absence of miR-155 also occurred when cells were cultured in IMDM, which is a medium rich in aromatic amino acids that promotes higher levels of Th17 cell differentiation by Wt CD4+ T cells compared with more conventional RPMI 1640 medium (Fig. 1C, 1D) (41). We observed very few RFP+ cells in both groups under neutral, non-Th17 cell skewing conditions, highlighting the specificity of this reporter system. Impaired Th17 cell development by the miR-155−/−IL-17F RFP+/−CD4+ T cells, compared with miR-155+/+ controls, was further confirmed by ELISA. 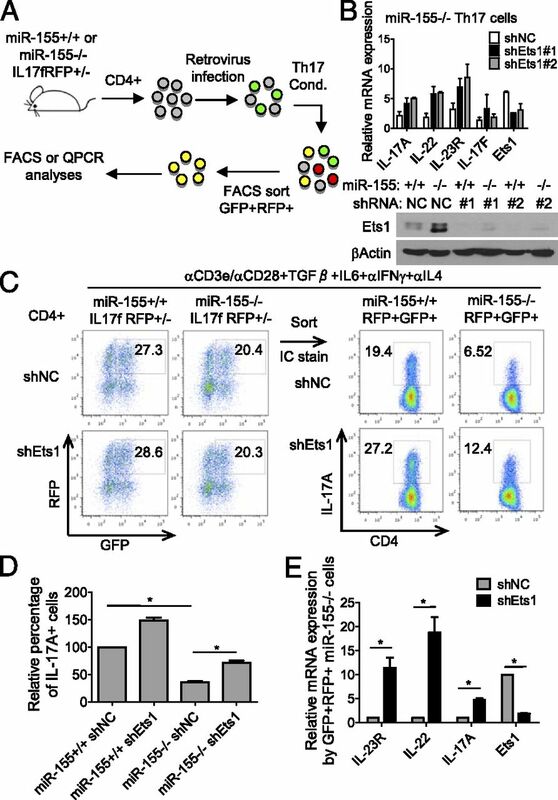 Results demonstrated defective concentrations of IL-17A, but not IFN-γ, in the culture supernatants from miR-155−/− versus miR-155+/+ IL-17F RFP+/−CD4+ T cells growing under Th17 cell–skewing conditions (Fig. 1E). We also observed the formation of some IL-17F RFP+ Th17 cells in the absence of miR-155. These data demonstrate an important role for miR-155 in Th17 cell development, and validate a novel reagent to be used for experiments with purified and viable miR-155+/+ and miR-155−/−IL-17F+ Th17 cells. Although naive miR-155−/−CD4+ T cells are defective in their output of IL-17–expressing CD4+ T cells, a portion of IL-17F+ cells are still produced. However, it is not known whether these cells are functional on a per cell basis. To begin answering this question, we performed a gene expression analysis on purified miR-155+/+ and miR-155−/−IL-17F+ Th17 cells (Fig. 2A). Global gene expression profiling was performed using a microarray analysis. Genes differentially regulated by miR-155 in purified IL-17F+ Th17 cells were identified, and this subset contained several genes involved in T cell–lineage skewing and Th17 cell effector functions (Supplemental Table I). miR-155 regulates Th17-related genes in purified IL-17F+ Th17 cells. (A) Schematic diagram of the experimental design. (B) Heat map of the differentially expressed IL genes in miR-155+/+ versus miR-155−/−IL-17F+ Th17 cells (n = 2). The colors represent normalized fluorescence values on a log scale. The color key is next to the heat map. (C) Relative expression levels of bic ncRNA and IL-17A, IL-17F, IL-23R, RORgT, and IL-22 mRNA in FACS-sorted T cells from (B) were assayed by qPCR (n = 2). Error bars represent ± SEM. Next, we used Ingenuity software to mine our microarray results and uncover canonical pathways most impacted by miR-155. This approach identified Th cell differentiation as the most significant biological pathway impacted by miR-155, and altered B and T cell signaling in rheumatoid arthritis as the second most effected process. Both of these are consistent with a critical role for miR-155 in Th17 cell biology during autoimmunity. Many of these pathway differences are represented by the expression of specific IL genes, which are either elevated or decreased in miR-155−/−IL-17F+ Th17 cells (Fig. 2B). Within this gene subset, we detected several that have been linked to Th17 cell biology, including IL-17A, IL-17F, IL-23R, and IL-22, that were decreased in miR-155−/−IL-17F+ Th17 cells compared with miR-155+/+ controls. Alternatively, cytokines representing other Th lineages, such as IL-4, IL-5, and IL-13, were increased in miR-155−/−IL-17F+ Th17 cells (Fig. 2B). qPCR was performed to validate these defects in Th17-related genes expression profiles observed in miR-155−/−IL-17F+ Th17 cells and among those assayed were IL-17A, IL-17F, IL-23R, and IL-22 (Fig. 2C, Supplemental Fig. 1). We also assessed RORγT mRNA levels and found minimal differences between the groups (Fig 2C). These data demonstrate that miR-155 is not only important for the development of IL-17F–expressing cells but also critical for the expression of Th17 cell effector genes in differentiated, IL-17F–expressing Th17 cells. We next sought to identify mRNA targets of miR-155 with relevance to Th17 cell biology. To systematically search for potential miR-155 targets, we further analyzed our microarray data from Fig. 2 using an ingenuity transcription factor analysis. Transcription factors predicted to be activated or inhibited in miR-155−/− compared with miR-155+/+IL-17F+ Th17 cells based on differential gene expression signatures between these two cell groups were identified (Fig. 3A). Because miR-155 inhibits expression of its targets, those transcription factors with a predicted increase in their levels in miR-155−/− cells were of interest (Fig. 3A, red line). On this list were several factors containing a conserved miR-155 binding site in their 3′-UTRs, according to Targetscan software, and these include Ets1, AP1 (cFos), C/EBPβ, and cMAF. Among these, our attention was drawn to Ets1 for several reasons: 1) Ets1 was the most likely transcription factor to be activated in miR-155−/−IL-17F+ Th17 cells according to our analysis (Fig. 3A); 2) it has a highly conserved bonding site for miR-155 in its 3′-UTR (Fig. 3B); and 3) it has an established function as an inhibitor of Th17 cells (42). miR-155 directly targets Ets1 in Th17 cells. (A) Predicted transcription factors targeted by miR-155 according to an Ingenuity transcription factor analysis of the microarray data from Fig. 2. (B) Conserved miR-155 binding sites in the Ets1 3′-UTR, and predicted interaction with the conserved 8-mer seed found within miR-155. (C) Luciferase assays were performed and found that the Ets1 3′-UTR has a functional miR-155 target site. The Picalm 3′-UTR and the miR-155 2-mer were included as positive controls, and the TNFR-associated factor 6 (TRAF6) 3′-UTR was a negative control. 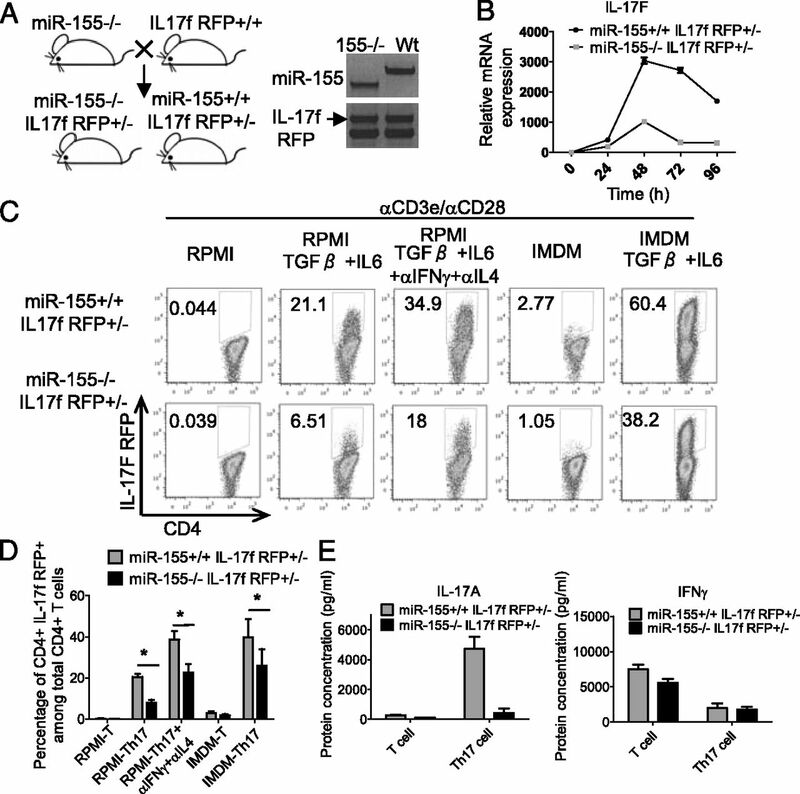 (D) miR-155+/+ or miR-155−/−IL-17F RFP+/−CD4+ T cells were cultured under Th17 skewing conditions. Seventy-two hours later, Ets1 protein levels were assayed by Western blotting (upper), which was quantified for multiple samples (lower) (n = 5). Error bars represent ± SEM. *p < 0.05. To determine whether miR-155 directly targets mouse Ets1, we cloned a region of the Ets1 3′-UTR containing the conserved miR-155 binding site downstream from luciferase and performed luciferase assays using 293T cells. Results indicated that miR-155 overexpression repressed luciferase in an Ets1 3′-UTR–dependent manner (Fig. 3C). Furthermore, mutation of the miR-155 binding site in the 3′-UTR abolished repression by miR-155, indicating direct targeting. We next tested whether miR-155 represses endogenous Ets1 in Th17 cells by assaying Ets1 expression in miR-155+/+ and miR-155−/−IL-17F RFP+/−CD4+ T cells under Th17 cell–skewing conditions. Expression of Ets1 was elevated at the protein level in miR-155−/− compared with controls (Fig. 3D). Taken together, these results identify Ets1 as a direct target of miR-155 in Th17 cells. Following the identification of Ets1 as a direct target of miR-155 during Th17 development, we next determined whether reducing its levels would impact expression of Th17-related genes in miR-155−/−CD4+ Th17 cells. To accomplish this, we built a retroviral vector that expresses an Ets1 shRNA based on a format that we have described previously (43). Using two different Ets1 shRNAs or a control vector, we transduced miR-155−/−CD4+ T cells and assayed the expression of Ets1 and Th17-related genes under Th17 cell-skewing conditions (Fig. 4A). Ets1 protein levels were reduced in cells expressing the shRNA cassette when compared with the control vector (Fig. 4B). Ets1 knockdown in miR-155−/− Th17 cells led to upregulation of several Th17-related genes, including IL-17A, IL-23R, and IL-22 (Fig. 4B). Of note, Ets1 knockdown did not affect IL-17F expression. Ets1 is a functionally relevant target of miR-155 in Th17 cells. (A) Schematic of experimental design. (B) miR-155+/+ or miR-155−/−IL-17F RFP+/−CD4+ T cells were isolated and infected with a control (NC) or Ets1 shRNA–expressing retrovirus. After culturing under Th17 cell–skewing conditions for 72 h, RNA or protein was extracted and expression of the indicated Th17-related genes were analyzed by qPCR (upper panel) or Ets1 by Western blotting (lower panel). (C) miR-155+/+ or miR-155−/−RFP+GFP+ T cells were sorted by FACS and subjected to intracellular staining for IL-17A. (D) Graph of the average relative percentage of IL-17A+ cells in sorted miR-155+/+ or miR-155−/−RFP+GFP+ cells transduced with the control or Ets1 shRNA–expressing retroviral vector (n = 4, two independent experiments). (E) Expression of Th17 cell effector genes in sorted miR-155−/−RFP+GFP+ cells transduced with the control or Ets1 shRNA–expressing retroviral vector were analyzed by qPCR (n = 4). Error bars represent ± SEM. *p < 0.05. To further define the role of Ets1 in purified Th17 cells, we took advantage of our IL-17F reporter system and sorted out RFP+ (IL-17F+) GFP+ (vector+) cells from both miR-155+/+ and miR-155−/−CD4+ T cells under Th17 cell–skewing conditions (Fig. 4A). Analysis of these RFP+GFP+ cells by intracellular staining and FACS revealed defective expression of IL-17A in the absence of miR-155 compared with Wt controls, and this was statistically significant (Fig. 4C, 4D). Notably, knockdown of Ets1 in miR-155−/− cells led to increased amounts of IL-17A+ cells, albeit this did not reach control levels (Fig. 4C, 4D). Moreover, Ets1 knockdown significantly increased the expression of other Th17-related genes in miR-155−/−RFP+GFP+ cells, and these included IL-17A, IL-23R, and IL-22 (Fig. 4E). Taken together, these results indicate that Ets1 is a functionally relevant target of miR-155 in Th17 cells. To determine whether miR-155 is required for the functionality of differentiated IL-17F+ Th17 cells, we generated miR-155+/+ and miR-155−/−IL-17F RFP+/− 2d2 TCR Tg+ mice (Fig. 5A). The 2D2 TCR specifically recognizes the MOG35–55 peptide, and T cells expressing this TCR can elicit EAE in mice on a C57BL/6 genetic background (37). By using this new mouse strain, we were able to isolate miR-155+/+ or miR-155−/− IL-17F+ Th17 cells that specifically recognize MOG35–55 and test the importance of miR-155 during Th17 cell encephalogenic function in vivo (Fig. 5B). We adoptively transferred 2 × 104 in vitro generated miR-155+/+ or miR-155−/−IL-17F RFP+2d2+CD4+ T cells into Rag1−/− mice followed by the immunization with MOG35-55 and administration of pertussis toxin (Fig. 5B). Mice receiving miR-155+/+ IL-17F+ 2d2+ Th17 cells had a substantially more severe disease course, with higher clinical scores, compared with mice given miR-155−/−IL-17F+2D2+ Th17 cells (Fig. 5C). Rag1−/− mice receiving the miR-155+/+IL-17F+2d2+ Th17 cells also had an earlier onset of disease symptoms, which began on day 9 compared with day 14, and a higher disease incidence compared with mice receiving miR-155−/−IL-17F+2D2+ Th17 cells (Fig. 5C, 5D). We also analyzed the brains and spleens from both groups for the presence of transferred IL-17F+ Th17 cells. Consistent with the reduced EAE symptoms, we observed significantly fewer miR-155−/− compared with miR-155+/+Vb11+CD4+ T cells in the spleens and brains of mice immunized with MOG35–55 (Fig. 6A, 6B, 6E, 6F). Intracellular staining of the recovered T cells revealed that miR-155−/− cell were defective in their expression of IL-17A (Fig. 6C, 6D, 6G, 6H). In addition, we also observed decreased IL-17A+GM-CSF+ cells in brain with miR-155−/− cell transfer (Fig. 6H). It is also of note that there were still reduced EAE symptoms in the absence of miR-155 despite the TCR having a fixed specificity. These data demonstrate that miR-155 is required for both the development and proper function of IL-17F+ Th17 cells during EAE (Supplemental Fig. 2). 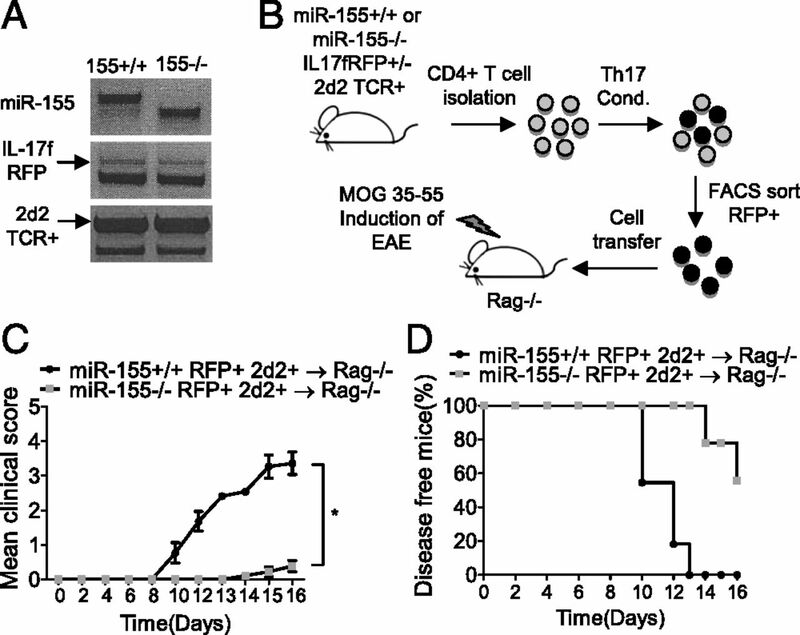 miR-155 promotes the function of IL-17F+ 2d2 TCR Tg+CD4+ T cells during EAE. (A) Genotyping results confirming the creation of miR-155+/+ or miR-155−/−IL-17F+/− 2D2 TCR Tg+ mice. (B) Schematic of the experimental design. (C and D) CD4+ T cells were isolated from miR-155+/+ and miR-155−/−IL-17F RFP+/−2D2 TCR Tg+ mice and cultured under Th17 cell–skewing conditions. Seventy-two hours later, IL-17F RFP+ 2D2 TCR Tg+CD4+ Th17 cells were sorted by FACS and equal numbers of miR-155+/+ or miR-155−/− cells were injected into Rag1−/− mice. EAE was induced in both groups by immunizing with 100 μg of the MOG35–55 peptide. (C) The disease severity was scored regularly based on clinical symptoms (n = 10). (D) Disease incidence was assessed for each group. Error bars represent ± SEM. *p < 0.05.
miR-155 promotes brain infiltration and cytokine production by IL-17F+2d2 TCR Tg+CD4+ T cells during EAE. CD4+ T cells were isolated from the spleens and brains of mice following experiments as described in Fig. 5, and (A–H) FACS analysis of the splenocytes (A–D) or brain cells (E–H) was performed. (A) and (E) show the percentage of transferred miR-155+/+ and miR-155−/−IL-17F+TCR Vb11+CD4+ T cells in each organ, whereas (B) and (F) show data for multiple mice in each group. (C) and (G) are representative FACS plots of IL-17A expression by the recovered T cells, and (D) and (H) show data for multiple mice. The percentage of brain IL-17A+GM-CSF+ cells are also shown in (H). n = 5 for the miR-155+/+ groups and n = 8 for the miR-155−/− groups. Error bars represent ± SEM. *p < 0.05. The IL-23/IL-23R signaling pathway is critical for the expansion of Th17 cells in vivo and the induction of EAE in mice, and polymorphisms in the IL-23R gene have been linked to human autoimmunity (17, 31–33). Because we observed defective expression of the IL-23R in miR-155−/−IL-17F+ Th17 cells (Fig. 2D), and reduced numbers of miR-155−/− Th17 cells during EAE, we speculated that miR-155 is important for the responsiveness of Th17 cells to IL-23. To test this, we sorted Wt and miR-155−/− IL-17F reporter cells following their development in vitro and examined their responsiveness to rIL-23. Following 20 min of treatment, miR-155+/+IL-17F+CD4+ T cells had significantly higher levels of activated Stat3 compared with miR-155−/−IL-17F+CD4+ T cells as determined by intracellular staining with an anti–p-Stat3 Ab (pY705) and FACS (Fig. 7A, 7B). These data indicate that miR-155−/−IL-17F+ Th17 cells are hyporesponsive to IL-23, likely because of reduced IL-23R expression. miR-155 promotes IL-23 signaling by IL-17F+ Th17 cells. CD4+ T cells were isolated from miR-155+/+ and miR-155−/−IL-17F RFP+/− mice and cultured in Th17 condition for 72 h. RFP+ IL-17F+ cells were sorted by FACS and replated in 96-well plates followed by restimulation with IL-23 for 20 min. Cells were subjected to p-STAT3 staining. (A) Representing FACS plot of p-STAT3 staining after IL-23 restimulation. Black lines represent cells without cytokine treatment and red lines represent cells with IL-23. (B) Graphs of the mean fluorescence intensity (MFI) of p-STAT3 (n = 4) before and after IL-23 treatment. (C) Schematic of the experimental design. (D) Representative FACS plots of IL-17A expression by MOG35–55 restimulated CD4+ T cells from the brains Wt and miR-155−/− EAE mice with and without IL-23 treatment. (E) Data from (D) are shown graphically for multiple mice. (F) Schematic of the experimental design. 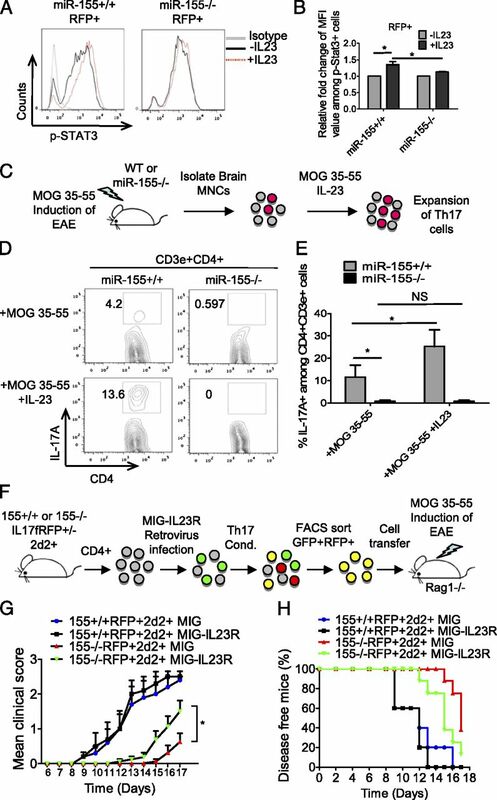 CD4+ T cells were isolated from miR-155+/+ and miR-155−/−IL-17F RFP+/−2D2 TCR Tg+ mice and infected with a control (MIG) or MIG-IL23R expressing retrovirus. After culturing under Th17 cell–skewing conditions for 72 h, miR-155+/+ or miR-155−/−IL-17F+2D2 TCR Tg+GFP+CD4+ T cells were sorted by FACS and equal numbers injected into Rag1−/− mice. (G) EAE was induced following the adoptive cell transfer, and disease severity was scored regularly based on clinical symptoms (n = 5 for the miR-155+/+ groups and n = 8 for the miR-155−/− groups). (H) Disease incidence was also analyzed for each group (n = 5 for miR-155+/+ groups and n = 8 for miR-155−/− groups). Error bars represent ± SEM. *p < 0.05. In another experiment, brain mononuclear cells were collected from Wt or miR-155−/− mice 13 d postimmunization with MOG35–55 and restimulated with rIL-23 for 3 d. The expansion of IL-17A–expressing cells was determined by FACS. Results demonstrated that Wt CD4+ T cells responded to IL-23 by expressing more IL-17A, whereas miR-155−/−CD4+ T cells did not have a response to IL-23 (Fig. 7C–E). These results further support a role for miR-155 in promoting IL-23 responsiveness by Th17 cells. Next, we attempted to complement the miR-155−/− Th17 cell phenotype by expressing the IL-23R in miR-155−/−IL-17F+ Th17 cells before their adoptive transfer into Rag1−/− mice. Overexpression of IL-23R was achieved by transducing miR-155+/+ and miR-155−/−2D2+CD4+ T cells with MIG-IL-23R or MIG control retrovectors, which have been described previously (39). After retroviral transduction and in vitro skewing, IL-17F+GFP+ (marking MIG-IL-23R or MIG+ cells) 2D2+ Th17 cells were sorted and injected into Rag1−/− mice followed by induction of EAE (Fig. 7F). Rag1−/− mice given MIG-IL23R+miR-155−/−IL-17F+2d2+ Th17 cells had an earlier onset of disease symptoms, which began on day 12 compared with day 15, and significantly higher disease scores compared with mice receiving MIG+ miR-155−/−IL-17F+2D2+ Th17 cells (Fig. 7G, 7H). Mice receiving MIG+ or MIG-IL23R+miR-155+/+IL-17F+2d2+ Th17 cells had similar disease courses, with an earlier disease onset and increased severity of symptoms compared with mice having received MIG+ or MIG-IL-23R+miR-155−/−IL-17F+2D2+ Th17 cells (Fig. 7G, 7H). 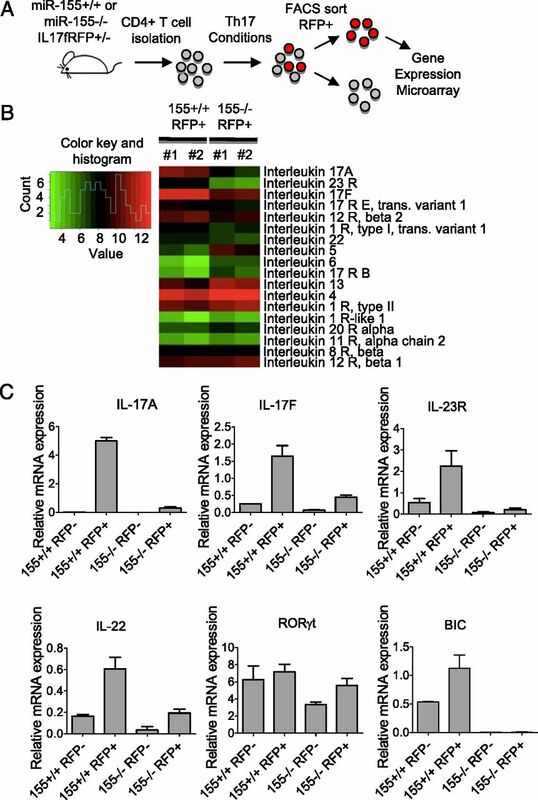 These data provide evidence that one important function of miR-155 during tissue inflammation is the promotion of IL-23R expression by IL-17F+ Th17 cells. In this paper, we evaluated the role of miR-155 in developed Th17 cells and made several important discoveries. First, miR-155 is required for expression of several effector genes in differentiated IL-17F–expressing Th17 cells. Second, miR-155 directly targets the transcription factor Ets1, a known negative regulator of Th17 cell formation. Thus, elevated expression of Ets1 in miR-155−/− Th17 cells inhibits effector gene expression. Third, IL-17F+ Th17 cells are functionally defective if they lack miR-155, and thus largely incapable of causing severe EAE symptoms like miR-155+/+ controls. Fourth, defective IL-23R expression in miR-155−/− Th17 cells results in hyporesponsiveness to IL-23, a pivotal step during Th17 cell pathogenesis. Taken together, these data significantly advance our understanding of how miR-155 impacts autoimmune inflammation during Th17-dependent disorders. Previous studies have found reduced levels of Th17 cells in miR-155−/− mice correlating with decreased autoimmune symptoms. However, it has been unclear whether the Th17 cells that are present in the absence of miR-155 retain normal function on a per cell basis. From a clinical perspective, it is important to determine whether therapeutic targeting of miR-155 in differentiated, pathogenic Th17 cells that have accumulated in inflamed patient tissues can diminish their functionality and thus disease symptoms. Our current study demonstrates that miR-155−/−IL-17F+ Th17 cells are incapable of causing severe EAE symptoms like their miR-155+/+ counterparts, and this phenotype is consistent with the defective expression of several effector genes including IL-23R. These results predict that inhibiting miR-155 could reduce Th17 cell function during human autoimmune disease. The identification of Ets1 as a target of miR-155 in Th17 cells provides insight into the ability of miR-155 to regulate Th17 cell effector function. Ets1 is a well-established negative regulator of Th17 cell development, and also targeted by another miRNA involved in the formation of Th17 cells, called miR-326 (19, 42). Thus, Ets1 appears to be a common target of miRNAs in the context of inflammatory Th17 cell biology. Ets1 is mutated in patients with certain types of autoimmune conditions, underscoring its connection to pathological tissue inflammation (44, 45). Taken together, Ets1 is emerging as an important node in the cellular networks that regulate human autoimmunity, and its therapeutic manipulation should be examined as a possible treatment. A previous study found that Ets1 functions downstream of IL-2 to block expression of Th17-related genes (42). Coculture experiments and exogenous IL-2 delivery demonstrated that Ets1 regulates the responsiveness of CD4+ T cells to the inhibitory effects of IL-2 on Th17 cell development (which appeared in this study to be more relevant than its role in promoting IL-2 expression). The study did not detect Ets1 binding to the IL-17A gene promoter, or Ets1-dependent effects on Stat5 activation. Thus, the mechanisms by which Ets1 regulates IL-17A and other Th17 genes (such as IL-23R) in response to IL-2 are unclear. Our experiments were done without IL-2 blocking Abs or addition of exogenous IL-2. The only IL-2 in the system was produced by the activated T cells themselves, and we did not observe differences in the amount of IL-2 expressed by miR-155−/− versus Wt T cells (Supplemental Fig. 3). Thus, the ∼2-fold increase in Ets1 in miR-155−/− cells is not sufficient to increase IL-2 expression in this context. Taken together with the study described above, it is possible that miR-155 functions to reduce the Ets1-dependent repressive effects of IL-2 signaling on Th17 cell effector gene expression. This will be an area of future investigation. Our study also suggests that multiple targets of miR-155, in addition to Ets1, are relevant during Th17 cell development and function. Individual miRNAs have the potential to repress many mRNAs. This multitarget nature of miRNAs, in addition to the inability of Ets1 knockdown to fully restore expression of Th17-related genes in miR-155−/− Th17 cells, indicate that miR-155 likely targets multiple relevant mRNAs in this cellular compartment. Further experiments will be needed to test whether other targets predicted from our ingenuity analysis, or presently unidentified, are being regulated by miR-155 during Th17 cell development and/or function. In order for Th17 cells to expand during autoimmunity, they must be able to respond to IL-23 that is produced by a variety of immune cells within secondary lymphoid organs and lesions that are created during autoimmunity (31). Certain genetic variants of the IL-23R gene that promote IL-23R function have been associated with human autoimmune disorders, including Crohn’s disease and psoriasis, as determined through genome-wide association studies. This further highlights the relevance of this pathway during human autoimmunity (34–36). Importantly, we found IL-23R to be among the effector genes that is regulated by the miR-155-Ets1 axis in Th17 cells, and provide evidence that miR-155−/− Th17 cells are unresponsive to IL-23 ex vivo. Furthermore, recovery of IL-23R expression by miR-155−/− Th17 cells partially restored EAE disease symptoms. The regulation of this signaling pathway by miR-155 is a promising component of miR-155 biology that has not been recognized previously, yet may turn out to be a central mechanism by which miR-155 promotes autoimmune inflammation. We thank Allan Bradley for providing miR-155−/− mice and Chen Dong for providing the IL-17F RFP reporter mice and the microarray and FACS core facilities at University of Utah. We also thank Angela Presson for help with the Ingenuity software. This work was supported by National Institutes of Health Grant 5R00HL102228-04. The microarray data presented in this article have been deposited in the National Center for Biotechnology Information Gene Expression Omnibus database (http://www.ncbi.nlm.nih.gov/geo/) under accession number GSE45122. 2010. Travels and travails of autoimmunity: a historical journey from discovery to rediscovery. Autoimmun. Rev. 9: A251–A258. 2008. Th17 cells in immunity and autoimmunity. Ann. Rheum. Dis. 67(Suppl. 3): iii26–iii29.
. 2012. TH17 cells in autoimmunity and immunodeficiency: protective or pathogenic? Front. Immunol. 3: 129.
. 2006. TGFβ in the context of an inflammatory cytokine milieu supports de novo differentiation of IL-17‑producing T cells. Immunity 24: 179–189.
. 2007. IL-6 programs T(H)-17 cell differentiation by promoting sequential engagement of the IL-21 and IL-23 pathways. Nat. Immunol. 8: 967–974.
. 2007. STAT3 regulates cytokine-mediated generation of inflammatory helper T cells. J. Biol. Chem. 282: 9358–9363.
. 2006. The orphan nuclear receptor RORγt directs the differentiation program of proinflammatory IL-17+ T helper cells. Cell 126: 1121–1133.
. 2008. The aryl hydrocarbon receptor links TH17-cell-mediated autoimmunity to environmental toxins. Nature 453: 106–109.
. 2009. The AP-1 transcription factor Batf controls T(H)17 differentiation. Nature 460: 405–409.
. 2007. The development of inflammatory T(H)-17 cells requires interferon-regulatory factor 4. Nat. Immunol. 8: 958–966.
. 2003. Interleukin-23 rather than interleukin-12 is the critical cytokine for autoimmune inflammation of the brain. Nature 421: 744–748.
. 2003. Divergent pro- and antiinflammatory roles for IL-23 and IL-12 in joint autoimmune inflammation. J. Exp. Med. 198: 1951–1957.
. 2010. MicroRNA-155 promotes autoimmune inflammation by enhancing inflammatory T cell development. Immunity 33: 607–619. 2011. MicroRNAs in human diseases: from cancer to cardiovascular disease. Immune Netw. 11: 135–154.
. 2009. Cutting edge: the Foxp3 target miR-155 contributes to the development of regulatory T cells. J. Immunol. 182: 2578–2582.
. 2011. MicroRNA-155 as a proinflammatory regulator in clinical and experimental arthritis. Proc. Natl. Acad. Sci. USA 108: 11193–11198.
. 2009. Foxp3-dependent microRNA155 confers competitive fitness to regulatory T cells by targeting SOCS1 protein. Immunity 30: 80–91.
. 2010. MicroRNA155 is induced in activated CD4+ T cells of TNBS-induced colitis in mice. World J. Gastroenterol. 16: 854–861.
. 2009. MicroRNA profiling of multiple sclerosis lesions identifies modulators of the regulatory protein CD47. Brain 132: 3342–3352.
. 2012. Expression of miR-146a and miR-155 in the urinary sediment of systemic lupus erythematosus. Clin. Rheumatol. 31: 435–440.
. 2011. Genetic association and altered gene expression of mir-155 in multiple sclerosis patients. Int. J. Mol. Sci. 12: 8695–8712.
. 2007. IL-23 is critical in the induction but not in the effector phase of experimental autoimmune encephalomyelitis. J. Immunol. 178: 2589–2598.
. 2009. Cutting edge: IL-23 receptor gfp reporter mice reveal distinct populations of IL-17-producing cells. J. Immunol. 182: 5904–5908.
. 2008. Association between genetic variants in the IL-23R gene and early-onset Crohn’s disease: results from a case-control and family-based study among Canadian children. Am. J. Gastroenterol. 103: 615–620.
. 2009. Genetic variants in IL-23R and ATG16L1 independently predispose to increased susceptibility to Crohn’s disease in a Canadian population. J. Clin. Gastroenterol. 43: 444–447.
. 2011. Inflammatory disease protective R381Q IL23 receptor polymorphism results in decreased primary CD4+ and CD8+ human T-cell functional responses. Proc. Natl. Acad. Sci. USA 108: 9560–9565.
. 2003. Myelin oligodendrocyte glycoprotein-specific T cell receptor transgenic mice develop spontaneous autoimmune optic neuritis. J. Exp. Med. 197: 1073–1081.
. 2008. TGF-beta-induced Foxp3 inhibits T(H)17 cell differentiation by antagonizing RORgammat function. Nature 453: 236–240.
. 2008. Sustained expression of microRNA-155 in hematopoietic stem cells causes a myeloproliferative disorder. J. Exp. Med. 205: 585–594.
. 2007. Ets-1 is a negative regulator of Th17 differentiation. J. Exp. Med. 204: 2825–2835.
. 2009. Inositol phosphatase SHIP1 is a primary target of miR-155. Proc. Natl. Acad. Sci. USA 106: 7113–7118.
. 2009. Genome-wide association study in a Chinese Han population identifies nine new susceptibility loci for systemic lupus erythematosus. Nat. Genet. 41: 1234–1237.
. 2010. Genome-wide association study in Asian populations identifies variants in ETS1 and WDFY4 associated with systemic lupus erythematosus. PLoS Genet. 6: e1000841.